The archetype of a Scottish romance hero is a Highland warrior wielding a sword in defense of his lady and his clan in the centuries before the Battle of Culloden in 1745. Those are some of my favorite heroes ever! 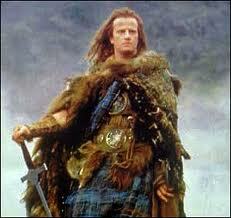 Take a look at Connor MacLeod (Christopher Lambert) from the first Highlander movie. Sooo masculine and yummy! But what about Scotsmen from other times, or from the Lowlands? I have the blessing (or misfortune) of characters that arise in my mind with their era and nationality firmly intact. This realization hit me while working on the book now entitled Her Scottish Groom. Although I originally intended him to be English, the book’s hero would not stop speaking with a Scotsman’s burr. (Obviously HSG wasn’t the working title of the book, lol!) Another challenge was that the characters for this book were creatures of the Gilded Age. Her Scottish Groom takes place in 1875, when Kieran, Lord Rossburn is forced into marriage with the quiet daughter of an American shipping magnate. Culloden is over 100 years in the past. Aristocratic families all over Scotland sent their sons to school at Eton or Harrow. Throughout the Victorian era, Scotsmen served the British Empire in roles from soldier and sailor to Prime Minister. (William Gladstone, who led Her Majesty’s government four times, was born in Liverpool but both his parents were Scots — a fact he pointed out with pride.) Robert Burns‘ poetry and Sir Walter Scott‘s novels still preserved Scottish pride in its culture and history decades after their deaths, while in science and technology, Victorian Scots blazed many trails. At the University of Edinburgh’s medical school, Joseph Lister developed antiseptic methods of surgery and argued for the acceptance of the germ theory of disease. James Clerk Maxwell formulated the electromagnetic theory of physics and predicted the discovery of radio waves. Future founder of the Labour Party Kier Hardie was a 20-year-old miner in 1875, and Patrick Geddes, a pioneer of town planning and the study of ecology, was 22. The steelworks and shipyards of Glasgow and the banking and mercantile business of Edinburgh provided most of Scotland’s employment opportunities in the late 19rh century, making life harder in north and west of Scotland. After a brief period of prosperity during the Napoleonic Wars, when kelp burning, weaving and fishing provided jobs, the potato blight that ravaged Ireland entered Scotland in 1846. This drastically affected the Highland crofters who depended on them for food and income. Clearances, the forced emigration of tenants by Scottish estate owners, also continued in the 19th century, while other tenants left the area for jobs in the south. While the fictional Rossburn estate of Duncarie is just east of the Highland line, it also suffers from the effects of famine and low employment. It is his family’s only estate, giving the hero a close bond to its crofters. Thanks for stopping by to read about a different Scotland than we see in most romance novels. What unusual time period or place would you like to read about in a romance? Next The Most Wonderful Time of the Year?